I’ve fallen victim to a new stitching addiction, and it’s making it very hard to tear myself away from embroidery these days, even to concentrate on other website-related and workroom-related activities. There’s a new version of Needle ‘n Thread coming out, for example. Yesssss! The All-New Needle ‘n Thread is almost ready to launch! But have I been paying attention to that lately? And my workroom! Remember that book mess? Have I figured out how to conquer it yet? Noooooo. Because I’ve been stitching. I can’t seem to stop stitching. I love being super-focused on embroidery projects. When I’m this focused, I can pretty much put everything aside in favor of my needle and thread. Any worries…any chores…laundry…eating…drinking… piffle! When I fall asleep at night, I’m thinking about embroidery. I dream about it. And when I awake, there it is again, in my head – with solutions and new ideas to jot down before the day begins. To sum it up in two words, it’s a kind of Creative Vigor that’s overtaken me. Right now, I’m concentrating with a fury on some new embroidery projects for Needle ‘n Thread. You can see an excerpt of one of them above. I’m calling the series Kaleidoscopes. And I love them! They’re fun. They’re addictive. They’re open to interpretation. They’re relaxing. They’re just… swell. But I’m Such a Dolt when it comes to naming things. Naming embroidery projects is part of the designer’s job. It’s not a part we as consumers ever think of, but I’m convinced that naming a project – usually in order to write about it, display it, or market it – is possibly the embroidery designer’s most difficult task. Deep down, I’d like pretty, individual names for each Kaleidoscope in the series. And I’d love to have a series of names that all go together but that represent, somehow (at least in my mind), the different designs. But, like I said, I’m a dolt when it comes to naming things! So I sat down with my niece Anna, who shares, in part, my sense of humor (poor girl), but who tends to be a little more refined than I am in many ways. She’s got a more “delicate” approach to things, whereas I generally don’t. Anna, on the other hand, came up with a much more appealing suggestion, which almost meets exactly what I would like in a series of names. I’m not going to mention it just yet, but it’s a great idea. It…sings! If you’re in the mood for some creative brain exercise, take a look at the photo above and ask yourself… What would you name that thing? It’s not finished yet, but the gist of the thing is there. All the colors are there. You can see that there’s a “burst” effect and there’s a bit of a floral element. The only thing that’s not complete in that photo is the outside edge. What would you name it? I’d love to hear your suggestions! If you’d like to join in the fun, you can leave a comment below with your ideas. And in the meantime, guess what I’m going to go do? Yep. I have to feed the addiction – back to stitching! How about “Burst!” It exactly how you described it, in your post! and useful extensions like Sun Burst, Star Burst, Lightning Strike, Sun Strike, or Blue Burst, Orange Burst, or …. How about Spring Fever? Can’t wait to see the complete set! I like Nancy’s name best, Spring Fever. And it gives a thematic start for naming the others–one for Summer, Fall, and Winter. How about POTPOURRI OF DELIGHT? Flower-plosion? Flowerburst? Ring of flower? Explosive pollination? A bee’s dream? Allergy season? LOL! “Allergy Season” would be right up my alley! It’s my favorite time of year, too! 🙂 I’m still chuckling! I absolutely love your work. It is gorgeous! As for a name for this piece how about Starburst Mandala? To me they look like FIREWORKS! You could call them that, or you could give them individual names, such as POW! or BANG! or KAPOW! SHOUT! after the pop song. How about naming it “kaleidaflora”? Why not look at the dominant colours and name them that way. Eg autumn spring winter etc. Or sunrise sunset break of day. I would call it “Serendipity”. Sounds like you really got in the zone with the lovely piece you shared today. Thank you for sharing – look forward to seeing your new site. who is also not good at naming designs! I vote fifty times for this one. Love the bright, summery feel. Call it State Fair! Reminds me of a Blue Ribbon you get at a fair! I love this blog! You do such a wonderful job. I don’t have any ideas for names, but it’s beautiful. I’d call the kaleidoscope embroidery “Catherine Wheel”! Mary, was it The Catherine Wheel by Patricia Wentworth? That book is a village cozy mystery by one of my favorite light reading authors. I just love this knew venture. Hope to see the published version soon. Both kaleidoscopes have spoken to me of the legendary places of fantasy and past history. The name that popped into my head when I saw this one was Mandalay. Perhaps a theme of legendary places could offer a source of names. I would name your latest project Sedona Sunrise. It has all the beautiful colors of an Arizona sunrise plus the lush greens of our local flora. 🙂 Oh, we came close to that one! My sister suggested “tequila sunrise.” But we were on a cocktail-names kick at the time. I do like sunrise-related ideas! I would name it “Americana Summer” it reminds me of the 4th of July in all it’s colors. It’s just beautiful. My first thought was Kaleidoscope 01, or 001 if you are really ambitious…. But to be more serious, how about something like “Flower Starburst”. The starburst is from the center part of the pattern, and the flower is from the outer part of the pattern, which is based on the original center starburst. Dayburst Kaleidoscope with a small #1 after the word kaleidoscope written like an exponent-… I don’t know how to do that on the computer. like the little 2 up in the air that follows the 3, for 3 squared. The two designs you’ve showed us so far are more or less fancy stars…sort of like fireworks that pop, and pop again, and again with new and expanding designs. So how about a play of some sort on the word fireworks–Kaleidoworks. Starworks. Or, how aabout the Japanese word for fireworks–hanabi–which means flower fire; essentially chrysanthemum shapes in gunpowder. I like the repeating themse in these designs–like a wave of fireworks and another version of it further out and yet another version…like fireworks that have a design and expand to a bigger similar but changed design and then it expands and changes again. I think a Nova series would be fun. The design reminds me of a starburst and a nova is a star that becomes incredibly bright. So you could call it Nova Bella, or Nova Prairie, or Nova Carmine or whatever. Just a thought. That’s a pretty one. I like it! I love your newsletter and drink up every words. For you kaléidoscope, the name that comes to mind is “explosion”. I really liked XV and XVII. Thank you for providing a link to these quilts. Mary, consider an off-center element as in #XV. I think that would made for an exciting mandala to stitch or to color. looking forward to this new design no matter it’s name will it be just the pattern or a kit? Here is my name for your first kaleidoscope embroidery. This is the way I feel when I look at it. I see lots of scallops in this kaleidoscope design. I did just have brunch and I’m not even hungry. But what about Kaleidoscope Scallopini? I’m sure you, or I, or your niece, or a reader could come up with something food-related for any future designs as well to continue the food theme, maybe even Italian food. Never having designed anything, this is not a dilemma I face. It may be very passé , but to me, if I was creating a series of related things, I would want to give them names that were related, and again that were a part of the series name. So, for example, if this series was called kaleidoscope, I woul just use letters from that word. There are lots and lots of choices, such as poise, posie, slide, deck, slice, eclipse, and so on. But that’s just how my brain works. On the other hand, I met a designer the other day who takes components of what she has done, for example twelve repeats, and googles foreign language translations of that word, until she finds a word she likes. I’m glad it is not a problem I have, as it sounds like many designers have a similar problem. Wonderful work Mary! How about something like “Spinning Wheel Blooms” or simply “Spinning Blooms”? The Mandala Kaleidoscope suits the embroidery very well. Beautiful by the way Mary. How about naming them after flowers? I see tulips in this one so I’d call it Kaleidoscope Tulips. How about : Star Burst or Flower Explosion or name them for characters in a favorite classic/ series. I’m not so great in naming mine either. I see a Dahlia series. “Kaleidoscope Garden” it may not be your choice by I think it fits! Thanks for all of your great info, I read blog daily and quite enjoy your funnies too! The first thing that popped into my head was “Maharini”. July means lots of fireworks in Ut because of the 4th of course and because of the 24th, Pioneer Day commemorating when the Mormon Pioneers reached the Valley back in 1847. Kaleidoscopes do remind me of the fireworks and you are stitching it in July – – – Maybe something like Mary’s Firework Celebration and then name this one Floral Burst. You have lots to celebrate in your life! I think naming a pattern or quilt or report is always terribly hard. Yout embroidery is beautiful and the only thing I could think of was “peeking webs”. I have been working on several Halloween projects recently and the purple part reminded me of some webs from the projects. They look like they are peeking out from the flowers. How about Kaliedescope Aquarius, Capricorn,, Saggitarius, etc. you can skip the ones you may not be fond of like Uranus–my third grader thinks it the funniest joke in the world? I too thought of a constellation when I saw your stitching. (It might have helped that I had just seen a picture of the Milky Way.) And you’re not limited to the zodiac – or even named constellations but other things seen in the sky. Like Nebula, Galaxy or Fat Jupiter!
. It’s not a good idea to leave a grieving man in a house alone for that amount of time. Nothing was done in the way of up keep. It’s up to us to fix it up and prepare it for sale. Now for the comparison. At the moment I’m not doing very much embroidery because I need new glasses but I am obsessing about sewing clothes. I look at patterns on line. I’ve amassed a large amount of fabric and when I’m not at work (in a fabric store); all I want to do is sew and sew and sew. To speak for myself; I think I’m escaping into sewing because I want to push the rest of my life out of my mind. If I stop thinking about my fabric, patterns and new creations, I’ll have to get into reality which means, cleaning, striping wallpaper, downsizing a house that has three generations of stuff in it and all three women including myself were collectors. I think if I walk in the land of reality; I’ll go mad. to keep us distracted and going. I also know I should do some laundry and thank goodness my husband feeds the cats and parrot. Exactly, Lora! It’s a good kind of “escapism” and helps balance things out! Mary, I love the term, “creative vigor!” Since that’s how you’re feeling, why not use the Greek goddesses of inspiration? The Muses, with their areas of influence and symbols, are: Calliope (epic poetry – writing tablet), Clio (history – scroll), Euterpe (lyric poetry – aulos, a Greek flute), Thalia (comedy and pastoral poetry – comic mask), Melpomene (tragedy – tragic mask), Terpsichore (dance – lyre), Erato (love poetry – cithara, a Greek type of lyre), Polyhymnia (sacred poetry – veil), and Urania (astronomy – globe and compass). Ooooh. You know, I like this! It certainly works as a series. Plus, it appeals to my classical art side. Hmmmm…will definitely consider this! I love this too Mary. Love this idea…and when you run out of Greek muses, you could do a steampunk design, call it Medusa, and appeal to a new generation of stitchers! I love your enthusiasm, it comes thru in everything you comment on in your daily pieces. I agree with the Greek muses if you are going to have a theme or cosmic as I think they look heavenly. Can’t wait to see the finished one and hope I can do one one day. out of all of the comments, i like this one the best. Mary, as to your obsession, my first thought was that for some reason, this is exactly what you need to be doing at this particular time. oh, this one gets my vote too. What a wonderful, unique idea! And yes, obsessions can be good at times… there are just some things we need to be doing to stay in focus and stay strong. I vote for this one. For an overall name for a series, how about Feu d’artifice? French for fireworks, and the thread you are using is French. How about Starburst Kaleidoscope? Whatever you name it, it sure is enticing. This piece of yours reminds me of a mandala. Although it can have a spititual meaning it also has and I quote from Wikipedia: “In common use, “mandala” has become a generic term for any diagram, chart or geometric pattern that represents the cosmos metaphysically or symbolically; a microcosm of the universe”. How about “A Method to My Madness”? Or “Stashbuster 1”? I see the freshness and brilliance of a ‘Prairie Morning.’ Really exquisite! I have to admit that I burst out laughing when I read your designs titles, Kaleidoscope 1, etc. How about ‘colour explosion’ or ‘spiders fantasy’. My first thought was Red Rooster. It will be beautiful when finished. Kaleidoscope Spirals # 1….# 2….# 3 etc. on how you challenge me to keep stitching! BUT because this style is your own invention, you need to take ownership of it, then compile it as a series. This one starts with and then adds to those pointed petals, or sunburst points. Starting with round tips could be the blossom or corolla tips. SO, my final choice is Mandalay Mary needlework. BUT I think you should allow your future publisher to help decide. I have no idea what to name your designs, but I can say that they are gorgeous! I’ve read through the comments and there lots of great suggestions. The one I like best is Guiditta’s. I think that using the muses would be very fitting. I’m glad that stitching is transporting you to your happy place. Savour it. Thank you for continuing to share with all of us. Artists name 1, 2, 3 in their work. Are you naming for the colorway or the shapes? For names you could use literary characters, Harry Potter characters, famous works of art, American towns, world capitals, feminine names, constellations, butterflies, dances, favorite authors, queens, movie stars . . . and you could add a word to indicate a colorway. Hence: Dumbledore Greys, Tucumcari Blues, Waltz Spring, Larsson Yellows, Oslo Holiday. That said, I have a lifetime history of offering an idea which becomes wildly successful only after others have jumped in with improvements. So, jump in everybody! I would name this one A New Day! How about “Radiating Prism”? I love this design and the colors, they remind me of when a crystal gets hit with sunshine..
Glad to see I’m not the only one who is reminded of mandalas by this! When I look at this the first thing I notice is the colors. They’re the same colors filling up my garden right now. So, Why not call it “July”? Because of the beauty of the colors, the essence it conveys and the artistry it is like looking into your soul. What is a souls it is love and that is what you put it o each of your projects . I would name it Soul Gazing. Have a blessed day and please keep dazzling us with you talent. I would name this ‘Joy’ because that is exactly what sprung to mind when I looked at it. Exactly! and “joy” has the same way of exploding inside you. It’s fantabulous! Call it “Whirlygig”! I work in silk threads and love them. I just bought a kaleidoscope for my art campers to use and after seeing this piece, I might have to create one too! Name them various women’s names (Lydia or Grace) or flower names. I have two. One is Carousel. The second is Supernova. I’ve read most of the comments, and those that have appealed to me are ones with a title for the series, followed by the name of the piece. Someone mentioned Fleurishes: Sunflower (or Lily or Rose or whatever flower the colors of the piece remind you of). I really like that one. Or another was Mandalove, which could be followed by something the design might look like; e.g., Mandalove: Starburst, or Sunrise, etc. The only suggestion I can come up with is Kansas: Winter, or Kansas: Starshower, etc. I love Kaleidoscope pattern on today-when can I get the complete kit or pattern??? Artist work in series, I am told (personally, I am fortunate to get one thing finished), so numbering the gorgeous kaleidoscopes would be a traditional artist’s way. Also, what about by color way? For instance, The Aqua and Red Kaleidoscope, or the Spring Green and Pink Kaleidoscope. I’m a huge fan of old ballads and fiddle tunes. I’ve gotten many a good title from lyrics and titles for my artwork from the old tunes. “Where the Wild Birds do Whistle” sounds much better than “Barn Study #5.” Your circles are so lively, I could see jig and reel titles for them. Love your blog. Sounds to me like you are having a fun time playing. PLaying reminds me of children. Why don’t you name it after some nursery rhymes. Found a bunch on the web with flowers. I like the one that goes.. Okay, its a little long but I like the name Mary, Mary. Also, you are on my prayer list. First let me say, you are my hero. For a naming series, check out a list of quilt block names. I think there are some good ones for you there: Cathedral Window, Pinwheel, Morning Star…the list goes on! My first thought is that it looks like a burst. So my suggestion for naming is ‘Burst of colors and red buds’. I’m curious what your niece Anna came up with. Well, the first thing I thought of was Popcorn….how about Popcorn Candy or Popcorn Dreams! But I got to tell you I love the idea of the Muses! Absolutely love this piece. ‘Fumes of Fantasy’ would be a suggestion. You can’t have possibly come up with such exquisite designs without implying, maybe even unconsciously,some symbolic meaning, which, I’m sure, we would all love to find out. That would also fit with your kaleidoscope idea, kaleidoscope being the metaphor of life. When I look at them, I would name the first one immortality and the second one exuberance. I do like the name Sedona Sunrise suggested by Pamela Green because of the colors. However if one uses other colors it may not look like a sunrise. The flowers look like tulips to me so I might call it Tulip Ring, Tulip Burst or something similar. Since it’s not a true tulip design I also like the various forms of Flower Burst, etc that several readers suggested. Starlight Reflections Will this pattern be available for purchase>? and you can put numbers with them when you do more. Mary, they remind me of the rose windows you see in churches and cathedrals. Why not name them after iconic cathedrals? Chartres, Canterbury, York, etc., etc. You get the idea. How about “Wellspring “? I see life flowing upward and out of it. I’m like you and can not names things well,but the first thing that came to mine was Star Burst. Thank you the colors are just great together . Even before I got to your ‘burst’ comment I was thinking of an astronomical theme. Starburst, Super Nova, Galaxy . . . The ideas would only be limited by the breadth of the universe. Perhaps you could name them after famous gardens or parks which you like, which are full of colour and flowers, or even places and the colours used could link to the country, e.g. White blue and silver for the artic , reds gold and oranges for India ! Think the designs are lovely, I should love to have a go at one some day! When I looked at your beautiful Kaleidoscope, I immediately thought Starflower. I like your thoughts on CREATIVE VIGOR…I’d go with that!! Bursting with flowers 1. Actually I love K 1,2,&3 That is how my mind works most of the time. The first thing that came to my mind is JOY. ( if in a series would be love,joy,peace). Thanks for sharing your beautiful work. My first thought was that your design looks circular and therefore like a mandela. If you meditate on one of these, it will appear in your mind’s eye when you close your eyes and, if it’s beautiful, as yours is, it will lift your spirit. You could call this one Spring Mandela, for instance. Oops, I scrolled down here to look at what others have said and discovered that the same idea has occurred to others, which means you have really struck a chord. Hats off, and keep stitching! Art is good for you. They remind me of the beauty of fireworks. The Flash and Flare of Color Series. As it’s going to be a series, my thought runs to something that can be the start of a grouping…these floral elements look like tulips to me. You could continue with other flowers…assuming that there will be other stylized flowers in other Kaleidoscopes. If this is the only one you expect to turn out with prominent floral motifs, Floral Fireworks? How beautiful! What about a music theme – thus would be Crescendo? Beautiful, Mary! For some reason looking at both kaleidoscopes made me think of two cities, Paris and Florence! Go figure! But I would name them after beautiful cities! The flowers? look like old fashioned sundae my mom used to buy me after the movies in the 40’s. So I like Sundae supprise. Love it by the way. The colors and the movement remind me of India. That’s probably more a critique on the beautiful embroidery. It reminds me of the marvelous depths of color and movement that are found in textiles from Inda. Mary ~ the two you have shown us are really pretty. They are a good way to use colors for fun and an array of stitches. There have been A LOT of great names. I think you need to do several more Kaleidoscopes in your series to use these names. Will be looking forward to patterns ! Spring Fling. July Jewels. Blossoms and Tendrils. Starburst. Wedding Cake. In different colors it could be Christmas Frost, Magi’s Star, Christmas Star. I think naming things is very hard to do and I’m not very good at it, or original. My first thought was firecracker but after thinking about it, I liked carnival better. How about naming them after jewels to match color schemes? They remind me of the facets in jewels. Topaz, emerald, opal, ruby, etc. You could keep the kaleidoscope part. I am also a complete dolt at naming anything I create, which I admit, isn’t much. I’m more of a replicator. I like all the Kaleidoscope/Fireworks/Flowers ideas, but would stay away from mandala, as that means something fairly specific. See the link: http://www.mandalaproject.org/What/Index.html. I’m a bit wary of taking a culture’s religious words and using them in a somewhat fanciful way. But it certainly is gorgeous! 🙂 Yes, me too, Cynthia…hence, kaleidoscopes, which I’ve always loved, anyway! I, for one, cannot wait until your kaleidoscopes are available. I don’t care what the name is, they’ll always be a Mary Corbet Design for me. I know too well how stitching addiction is. I’ve been working on a Trish Burr Zentangle during these hot weeks and although I promise myself that I won’t go near it until my chores are done I can’t help myself. It sits there on the hoop begging for a few more stitches. Before I know it my hands are stiff and the day has gone by. It’s self indulgence to the extreme but it makes me feel so happy! Sanity….stitching brings this to a lot of people. I think this luscious design should be called Stars of the Orient or Oriental Stars. Looking forward to seeing it finished and the rst of the series. What about calling this one Celestial Tulip, because it looks like tulips around the edge. You could call the others Celestial Rose or whatever their most prominent feature is. I like celestial because of the star at the center, but also because they are heavenly, unearthly and lead us to contemplate the beauty of the world around us and beyond.You are such a gifted stitcher! Meg, Jo, Beth & Amy. My suggestion would be to name it after a gemstone of the predominant color, I.e. Sapphire, Ruby, Turquoise, etc. Well it is obvious that I can’t really help since I would have gone with your idea. But, I will say that that flower looks like the tulips that are painted on a cabinet I have. So maybe “tulip kaleidoscope”. Lovely to see you are so full of enthusiasm. Sounds like you might be on to a winner with this. Suggest you jump on bandwagon of colouring craze and use ‘Colouring kaleidoscopes with Needlenthread’. Then just number them CK1, CK2,……let’s aim high CK100. Then all your followers can easily compare how many they have completed. You could sell kits! Easy to mail order with a numbering system. I’m usually pretty good at naming things (I always wished I had a job naming nail polish or lipstick), but the best I can come up with here sounds like a horrible casserole – “Eggplant Surprise!” I should keep trying – “Eggplant Elegance”, “Deep Purple” (It kind of reminds of the song), “Desert Sunset” – that’s the one I’d go with. “Desert Sunset”. How about Mardi Gras? It is so colorful and fun! Summer Reflection…Fall Reflection…and so on…or even Firework Reflection because stitching is reflecting who we are! I’d name it ‘ Primary Radiance’. It’s a beautiful design starting with primary colours bursting forth and radiating out to incorporate secondary colours. The two you have shared with us are very feminine and delicate in visual movement. I would give each one a girl’s name that are unmistakenly female in sound. For example, Amanda, Felicity, Pollyanna, Suzette, Marianne, Marybeth, Angelica, and of course, Anna. I would love to do this series. If the rest are like the first, and I’m sure they will be, … beautiful! These remind of Spain, and the bright colors do evoke a musical, happy feeling. I would name them all after Spanish dances, or Spanish ladies. Carmen, Dolores (dark colors), or Laia. For dances you could go with Sardana, Bolero, Zambra, Fandango, or Flamenco. whatever you name it, it’s gorgeous!!! You are right Mary, naming a project is very difficult! When I’m working on a quilt the name often times just speaks to me and life is easy. It looks my ‘Granmother’s garden at sunrise’. Her flower garden was a symphony of color especially at sunrise. Numerous designers have asked for suggestions from their followers — you are in good company. This makes me think of flowers. Based on the colors, how about “Fuschias and Violets”? Have fun deciding, and remember, we haven’t seen your other idesas (yet!). Composers in the past obviously knew this difficulty and numbered their works. Some lovely names have been suggested. All the best with your selection! Oooh, this gives me an idea. Sun flare. Then have a ‘sun’ theme for the rest of them. Depending on how many kaleidoscopes you intend to make, you could give them Seasonal colors. This one could be Spring. Or you could create them in Holiday colors. I must say that originally I wasn’t crazy about this design, but since you have added the filled-in areas of orange this is turning out beautifully. I get the feel of Eastern European embroidery. Bohemian style, Wycinanki style (Polish style), Bulgarian folk art, Hungarian, …. Maybe using the names of some of the Eastern European Rivers because of the flowing nature of this work. It is very beautiful and exciting! This reminds me of the tiles found in Morocco and Mexican villages. My husband and I have had many wonderful dinners set upon similar colors either painted or tiled upon the tables. It reminds of Spanish Nights! When I see your work progressing from post to post, it reminds of visiting a friend and seeing what she is stitching at that time. Can’t wait for the finished project and looking forward to see more of your work!! How about a flower name attached to the word fractal. Like Dahlia Fractal. Parity Tulip Fractal. I sure hope you’ll put together a book of kaleidoscope designs! If I was creating a name series I would either use the seasons – summer or spring comes to mind for the design above. Or perhaps emotions. eg hope, happiness, introspection, dreaming (pso ok, perhaps the last two aren’t emotions but they fit). How about spring dreaming? Dear Mary, thank you so much for all the motivation and expertise you’ve shared through the years. You are an endless source of inspiration. I would name a collection of kaleidoscopes after the planets and other astronomical bodies. The one on the picture I’d call Jupiter. Star of Seville, because it reminds me of the patterns and colors of Spanish tile work. I think ‘radiance’ is a fitting name. The design radiates out from the central star, and the colours are radiant. What about the seasons – eg Summer kaleidoscope, Winter kaleidoscope, Spring kaleidoscope and Autumn (Fall) kaleidoscope – each one could be in the colours of the seasons. Why don’t name it … Sun, like Earth’s Sun, as another one could be Jupiter’s Sun (I don’t know if Jupiter has a sun, but… well, is it so important ? ), Mars’ Sun, etc. Those coloring books seem to be the “hot ticket item” these days! I got one to trace dorm fun designs for hand embroidery myself! I have read several wonderful names on here. I can’t think of any other unique names so I will just give you something to consider. Delicious just like your kaleidoscope embroidery picture. Your work is beautiful! The circle design reminds me of a ferris wheel – I would call it Floral Ferris. And as an afterthought, please don’t name them mandalas. Mandalas aren’t just pretty circular designs, they have specific religious and cultural meaning, and the term has been appropriated in really offensive ways. I am like you, no matter the name. I can ‘t wait to see Kaleidoscope 1, 2, 3, . . . The one you are doing look already so beautiful , I love it. Thank you for all you are doing for embroidery. Just my thoughts but I’m sure they are many others is this creative community and I love you all for bringing so much creative energy into our world. It’s so beautiful. Reminds me of a Turkish tile. You could name them all after exotic sounding places. Maybe first one Istanbul for example. Why not embroidery mandala,it’s beautifull. I think I would be very tempted to name this series after stars. Beautiful! Mandala is what came to my mind as soon as I saw it and now I see that I’m just echoing what others here have said — great minds !!! I have a collection of kaleidoscopes. I absolutely love your newest addiction! I would blame this “burst of inspiration” or “floraburst”. I’m sure she would be thrilled. How about Solar Flare? It’s just gorgeous, Mary! Reminds me of the childhood art set called “Spirograph”. But I also see flower design, so how about “Spirofleur”. ? I could not read all the replies at the moment so maybe someone else had this idea. I like Mandals and I like flower names for this project so I might name them like this: Rose Mandala, Lavender Mandala, Sunflower Mandala and so on. Because flowers are really very often a perfectly beautiful mandala! Understand why you can’t sleep – gorgeous threads, wonderful designs, and beautiful craftsmanship (or craft woman ship). Totally beautiful and admire your eye….am able to follow most patterns but don’t have the vision to develop my own patterns. I’m also hopeless at naming things. Before you suggested it I was thinking Kaleidoscope 1, 2, 3, … About the limits of my ability. Great that you have a talented nice. So please you are experiencing creative vigour. Such episodes are worth their weight in gold! Enjoy it while it lasts (and long may it do so). I would call it Fiesta Sunburst. The colours remind me of the beautiful spring days here in Australia in strawberry season. Stunning blue sky, warm sunshine and rows and rows of strawberries plump and ripe and bursting with goodness. I would call it “Strawberry Spring Burst”. Do idea, but it is beautiful! I don’t have any name ideas, but it is BEAUTIFUL! It’s beautiful. Just like a ‘Rainbow Sunburst’. Just looking at that design reminded me of an explosion….Galaxies… so googling found lots of inspirations in lists of nebulae, supernovae, constellations and all their permutations, an endless source of names. Lots of stellar stuff is just numbers but I did find such names as Calabash, Triffid, Cygnus, Tycho, Medusa, Ghost of Jupiter. Incidentally there are lots of colours and shapes there that could be inspiring too! How about “Rainbow Variations”? Then they could be numbered 1, 2 and 3 etc. This name is a combination of your intense love of embroidery and the brilliant colors and shapes created in your piece: Embrocia Flora. That way you shouldn’t ever run out of future names that fit the series. To me the piece is like a dance, it jumps out and grabs you, an explosion of colour and energy, it even looks like the traditional costume of a dancer. So my suggestions is name your series after dances – Allemande, Can Can, Fandango, Flamenco, Gavotte, Lyrical, Sarabande, Tango, Waltz… the list is endless. I love the suggestions so far, especially the ones for different names of fireworks. If you want to consider another direction, the patterns remind me of Moroccan tiles. Lots of names associated with those, too. I had a thought about the book you’re putting together with these patterns. Have you considered including some snowflake patterns as well? I’m thinking that the stitching techniques would cross over and/or that some of these burst patterns could also be done up as snowflakes (for example, by selecting only some of the lines to transfer. The book might include some ideas about or samples re: how to modify the patterns and color choices.). I seem to remember that you’ve posted snowflakes in the past, as well. A 2 for 1 deal. Just like Kansas — beautiful in both summer and winter. My first thoughts were of bright juicy fruits, so I was thinking about berry burst or fruity blast. Unfortunately, I read through the comments and realize most people here are much more clever in naming than I am. I’m curious if you envision a way that these designs would be used or displayed other than a traditional round frame? I’m no good at stirring up that sort of idea either. Mary I would like to give the name RAINBOW. It’s just so pretty. I have no words to describe. Hi, I look at this and previous one, and think of a Star Burst. How about after stars or planets? Hi Mary, I love the design. How about “Cherries Jubilee”? That’s the first thing I thought about. Beautiful piece! It’s so perfect for the season…how about “Summer Love”? How about Imagine This !! The next one could be And This Too ! See you are not the only one who gets overwhelmed with the gorgeousness of embroidery . I haven’t read any of the other suggestions, so for all I know I’m just the millionth person to suggest this. (I’m really sorry about that… If that’s the case…) Wait for it…. Wait for it…. Beatles lyrics!! Ta-da!! No, I have not smoked anything. Just went on a little excursion that may or may not be of any inspiration. But! I am totally serious about, let us call it borrowing, lyrics (or simply the song titles, though that’s not as fun) from the Beatles. Again, sorry if this is the millionth time you’ve received this suggestion. Also, I dream about embroidery, as well. Though they’re mostly nightmarishly boring and frustrating journeys to find the right thread. Shrug. So, I don’t know how to end this wordy comment… Uh, a curtsy? Let’s go with that. I think Kaleidoscope is a perfect name for the project seies. The design you show looks like a Kaleidoscope view: mirror images, symmetry, reflections and colors. Reminds me of Spring flowers bursting from the ground as when tulips & hyacinth bloom in March & April. How about “Burst of Spring”? Star burst immediately came to mind. It reminds me a little of a plant in my garden which is called star burst bush. Would you think that the name ‘Kaleidoscope star burst’ would describe your design? I think a Burst of Summer would be a good name for your embroidery project.As red is predominate and it gets red hot in Australia, I thought that would be a good name. Of course after that you could name them after each season. By the way I love it and look forward to having a go myself. The colours and design remind me of Tudor designs…and The young Princess Elizabeth was a skilled stitcher and sometimes able to escape and be carefree, so the lovely free colours within the confines of the design describe her early life perfectly. What to you think of Kaleidoscope Sunrise? Hello Mary, I don’t have a creative name for your very, very beautiful kaleidoscope but I would like to know whether you transferred the pattern onto the fabric yourself or whether it was printed on? I would love to do something similar but not sure how to go about it. I live in Johannesburg, South Africa. Hi, Carla – I transferred it! Carnival or Rio, the colours remind me of hot tropical places that burst with like and colour! It just explodes from simplicity to a secret garden. It makes me think of India, so Indian Romance would be an I ticking name to me. Call it “Summer Picnic”. It reminds me of watermelon, fireworks, and hot summer days. I look at this–and at your last one–and see something fun–and also the explosive interjections in old Batman comics. This made me come up with the following linked names: Zap! Bam! Pow! I and my husband like MOSIAC!!!!!!!! the design is really delightful and i would call it Starpeace, for the blowing effect and peace for the calm it confers to the embroiderer. you could name each project from a star. i hope you fare well and my thoughts are with you. Mh, naming is a hard thing. I thougt of circles an that they have no beginning and no end. And if you bend a circle you can create the (Greek/mathematic) symbol of “Infinity”. And you have while stichting it much joy and after it is finished, looking at it will be also fill you with joy and happyness, because of the colours and motivs. I think I would call the series “Infinite Joy” and every design with a suitable name. However you will name it. Your work ist so beautiful and the most important thing is: That you are happy and filled with joy while working it. That you will gain energy and strenght for fighting the things, which you could put aside during stiching. I would name it Rainbow Song or Rainbow Burst. Coleidiscopes Falling for Autumn (a walk with Nature), plus other events such as Thanksgiving, Easter. Seeing the red cololurs reminds me of strawberries and the blue checkers of tea towels and reading as to how much fun you have been having whilst embroidering, I would call it “Strawberry Jamming”. I know what you mean about being focused on a project it’s really addictive. Beautiful embroidery and I can see why you are addictive to it. I can’t think of the right name for the project but you have a lot of ideas from other readers so I’m sure you will give it the right name. I can’t wait for the launch of the new Needle’n Thread website and all the goodies in store for us. 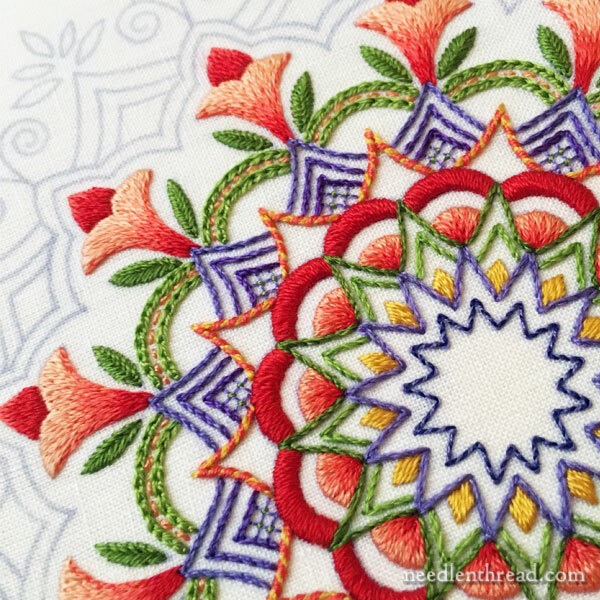 Thanks for sharing your latest Kaleidoscope embroidery project and the name dilemma and for the news of the launch of the new Needle’n Thread. Looking forward to the chosen name of the Kaleidoscope project. Take care. How about Carousel.The design goes round and round. I think naming a project is kinda fun. makes one’s brain get into the creative side of things. P.s I love your work so much color brings happiness to my life and this series is gonna be so up my alley! It reminds me of an Arizona sunflower. Thanks for encouraging us and for igniting enthusiasm into us. God bless. You have had a ton of replies and suggestions. Glad you have the ‘stitching bug’ back. The name that sprang to mind was “sunburst”. The centre looks just like a sun and the various levels seem to be bursting from the centre. It gives a nod to the exploding star and flower elements. Beautiful design by the way! Because of all the beautiful color and the interesting design, I see movement. I would call it Merry-go-round. Glad your well again to enjoy this. RESURGENCE – this piece has a beauty, energy and vibrancy about it. You have conquered and it shows. When I look at this design I see stars flaring with color. So my suggestion is Flaring Stars. It could also be Bursting Stars. But they are more flaring with color to me. Love your site. I love silks also. I used to do all my Brazilian embroidery with silk until I started using EdMar rayons which at the time were more available. Now I am mixing threads more. How about one that it Burst as suggested and then next be Blooms if that fits then the third can be another “B” word depending on what it loks like. The is assuming Kaleidoscope is the start of each name. I’m another on the Mandala team. Each one could be a different Mandala. So this one could be Flower (or Floral) Mandala, others could be Fireworks Mandala, or Royal Mandala or whatever key feature it has. “Summers Delight” I opened your email first thing Monday morning and it (the colours) just hit me with everything citrusy fresh, crisp and ready to bring in a new season. So this is my entry. Love your embroidery and am eager to start up myself in among all the other craftprojects that are underway. Blessisngs Robyn. Whatever you call it, I LOVE it! Can’t wait to see the others in the series. I think it looks like a Sunburst. I also like the Mandala concept as it does have that look about it? So, Sunburst Mandala could work? I also like flower-burst! I´m useless at this name-giving thing (I sometimes even wonder if I gave my children appropriate names 🙂 ) but the colours you are using make me think of cherries and/or strawberries! Whatever you name it – it´s beautiful! To my the obvious name is “Busy Fingers” then again could also be called “My Addiction”. What ever name you choose it is delightful. It reminds me of a “BURST OF CITRUS”. Someone also said “Fiesta” which I like. The kaledocolorsplash is excellent.How to have the complete design. The colours and design immediately made me think “Tutti Frutti”!! What a lovely design and what beautiful colours!! C’est magnifique !! Today, while looking up macro photos on bugs i came a cross the following and thought to share it with you. Igor Siwanowicz http://photo.net/photodb/photo?photo_id=17625471. Enjoy !! I think I would name it “Petal Poppers”. The central burst or pop looks as if it is coming from the first ring of petals. The term Fleursplosion popped into my head first though…. I’d name it, “Reaching for the Stars”. Don’t know why but I got that in my mind when looking at it : Sundance energy. Maybe because of the “explosive” central part, which like an explosion in comics. Beautiful work of yours and a damm good idea that kaleodosmandala of yours ! Oh sundance ist a lovely word. I found in the internet no translation into German. I would be very happy if you or someone else could explain to me, what “sundance” mean/describes. Is it a certain time like sunset? Or Sunbeams dancing in the air (f.e. when the sun shines through leafes of a tree and only a few beams reach the soil)? “Sundance” has become a more general and less meaningful term in American English. Robert Redford’s “Sundance Film Festival” is an example. People use to to describe or name all sorts of things. It also was used to describe part of the miracle at Fatima, if I remember correctly….the sun danced in the sky. Looks like you have great names suggested here. I wonder if you could combine some of the suggested names with words for addiction, since you describe yourself as being addicted to the kaleidoscope project. You could have names like Starburst Addiction, Kaleidoscope Craving, etc. Whatever you call it, it looks beautiful. I love reading about your creative adventures. Those are good names…..and Floss Fanaticism, Cotton Conundrum, Plumed Puzzle…..??? “Millefiori” popped into my head the moment I saw your work! It is so evocative of those charming Venetian beads as well as those tiny candies that I remember from my childhood. Your colors are ripe & rich, like a summer day at a farmers’ market. But Millefiori are available in every imaginable hue, creating an unending palette of combinations. Is any part of your ancestry Italian? If not, you can still adopt an Italian persona, a la SCA. Perhaps Maria Corbetti? ;-). The series is “Obsessions”. Because it is an obsession. THE FIRST ONE COULD BE CALLED FLOWER BURST. I think it looks like a Summer Mandala. That’s what I would name it. It’s beautiful and could easily be the focal point to begin a meditation. I know I am late in chiming in on this thread, but I was thinking something like “Evolving Stars” or “Exploding Stars”. How about Bursts of Blossoms or Bursts of Spring Blossoms! I love the colors and reminds me of the early spring blooms on the farm. Looking forward to seeing the completed project. What do you think of “Explosive Joy”? I would call it Blooming Tulips or Sparkling Tulips or Tulip Stars, there is my two cents worth. and maybe the flowers are not even tulips, just look like them to me. I loved you using the word “piffle”, it was one of my Mammaw’s favorite words and I don’t think I have ever seen anyone else use it until now. So thanks for causing me to think of her. She loved doing hand quilting, so a needle and thread and a design, just a little different. For a completely different spin… Lotus Pagoda. Oh this speaks for itself…Starburst! I adore naming things! In my world, onomastics (the study of names) is second only to embroidery. For your Kaleidoscope series, I would use a tried-and-true method with a formula you could easily follow: name them with girls’ names. I think the one you’re working on now is “Lydian.” Cheers! Using the mandala prayerful theme, Peace, Love, Harmony, Joy, Wisdom, Balance, Patience, Hope, etc. I’d call it French Starbursts. I’m basing that on the Fleur d’Lis motif I see in the design, plus I like the “burst” description you used and suggestions from other commenters. My first thought was Joy! You have such happy colors in this piece. I get so much joy from my needle work as so many other do. Or how about “Joy in the Morning” as these colors remind me of the first flush of summer flowers..
Oh, all these creative responders…. May I suggest naming for nebulae or galaxies? Actual ones such as Pinwheel Galaxy, Fireworks Galaxy, Flame Nebula, Pillars of Creation (part of the Eagle Nebula). There is Pandora’s Cluster part of the Sculptor constellation. A variation could be mixing nature with the stars to produce names like: Tulip Nebula, Prairie Cluster, Sunflower Nebula, Indiana Star, Corbet’s Cluster, Mary’s Expanding Universe and for the difficult to finish, Stitchers’ Black Hole. Have fun! It’s good to let your mind flow and let go of some thoughts that are destructive or just plain wearing. Although I have not been faced with the ongoing anxieties the level of yours, I have had several episodes this year that has required some middle of the night coloring sessions to quiet my brain. One can almost feel the calming effect of your designs as you work them. I can only say work on it’s good for you. May I suggest MANDALA. In my experience, MANDALAS are fun visually, and very meditative to create. (Also, MANDALA is easier to spell than kaliedoscope.) Some books: Celtic Mandalas by Courtney Davis, Power Mandalas (adult coloring book) by Klaus Holitzka, Mandalas for Healing by W. Mertl & H. Janko. Enjoy your Needlenthread E-mails. Wishing you health. Oh my gosh, it’s so funny…when you asked, I immediately thought Burst! Then I read on and saw that you actually said the word. I have not read any of the comments, but I like the idea of a series like Burst, Glow, Shimmer, Surge, Radiance, etc. I guess words that sort of describe fireworks, since that is what this piece reminds me of. Finding your blog has been a big blessing to me, so again, thanks very much. Your stitches do the walking across your fabric, a labyrinth. As a designer, names that are simple and vague tend to allow the viewer to see what their minds eye sees…in the comments stitchers see “Tulips, Starbursts, fireworks, flowers” etc. part of the enjoyment of this design is to keep looking to see what you see next…each time you look you see a different element – the red – gentle scallops, how the colors and designs mix and play and stitch choices blend and move. Because Adult coloring books are so popular at the moment – this reminds me of a color book design – it could be done in any choice of colors and so fun…giving such creative freedom! There are those that will make it Exactly as you design it, and there might be a few of us who instantly think “I wonder what it would look like….?? Ha! A name that has no inference but is catchy…”Look At Me” 1, 2 etc or “Color Fun” I,II or if you’re planing a series and want to post stitchers results maybe a name like “Thread ColorIng”, 1,2? I can’t wait to see what you choose! I love your work and your blog! It’s my go-to for stitch variety how-to! Thank you so much! When I look at the colors and the bursts and the way your needle dances through, I think of Flamenco”. Dear Mary, your website and your newsletters are such an inspiration and a wealth of information. Thank you! Sunburst collision , don’t know why but seemed like what it looked Ike to me! Seasons came to mind and I am sitting outside and the picture fit right into my view of Hollyhocks fustia roses tiger lilies rudbeckia and snapdragons. We lived in San Antonio for years and the colors and pattern remind me of the mexican pottery available in El Mercado downtown, or of the skirts of the beautifully embroidered dancers. Rio, in honor of the Summer Olympics. It would be neat to have 5 interlocking rings, each with a focal color matching the Olympic rings. I like the Mandala concept. Color bursts? Energy bursts? Embroidery songs? Color songs? When I first saw the photo on the article about your new “kaleidoscope” project, my first thought was MANDALA. After reading the article, it seemed appropriate. Coloring mandalas while meditating is a popular hobby these days. Why wouldn’t stitching mandalas be the same way? We certainly think (meditate) about things while stitching! Then I thought , “Why not create a series of mandala patterns (geometric designs) without a color chart? Let the stitchers pick their colors and stitching patterns whether it be all cross stitch or a mix of different stitches as the mood takes them?” This may not be a great title but it seems like a nifty idea for a pattern series. I would name it “Explosion of Colors”. Wow! I’m thoroughly enjoying following all your progress and appreciate your detailed doings. You are inspiring. What about Blue Sun? For the blue sun shape in the center radiating towards the flowers. From there you could go to golden sun, midnight sun, blue moon, harvest moon and on. When will this be available as a pattern? I love it!! How about “Circle of Roses”? Previous Previous post: Inspirations Embroidery Kits – a Grand Give-Away!